America wakes to the news of an assassinated President – the first in the nation’s history. Days earlier (April 9) the South surrenders to the North, effectively ending the Civil War. Pres. Lincoln speaks about his future plans for America, incl. offering citizenship to Black Union soldiers. John Booth, confederate sympathizer, who previously conspired to kidnap Pres. Lincoln, decides to plot his murder. A quotation embroidered into President Lincoln's jacket lining from a speech delivered by one of his political heroes, Sen. Daniel Webster. 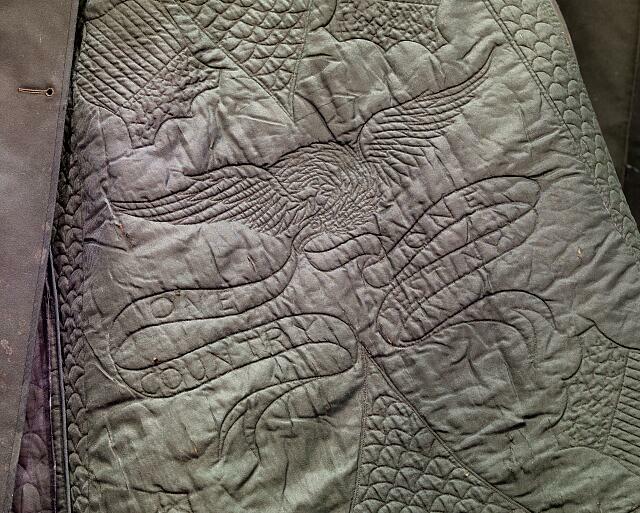 He wore this jacket when he was shot at Ford's Theater, just after 10 pm the night of April 14th. John Booth, an actor, used his connections to sneak into the theater, and shot the President at point-blank range before escaping. Pres. Lincoln died the next morning, April 15th. Booth later died in a standoff with police. Warren Commission Report, 1963, after Pres. Kennedy's assassination. It wasn't until *after* the assassinations of Pres. Garfield (1881) & Pres. McKinley (1901) that the Secret Service provided full-time protection for the U.S. president. The platform that held Pres. Lincoln's casket as he lay in state at the U.S. Capitol after his death continues to be used for those who lay in state today.